The martial arts craze has spread from Japan and China to the West. Karate, Judo, Jujitsu, Kung Fu (Gong Fu in Chinese), and Taekwondo are some of the more popular martial arts. If you are a martial arts fan, this is the page for you! 100% Hand Made - No Prints! Great Prices - Only $24.99! 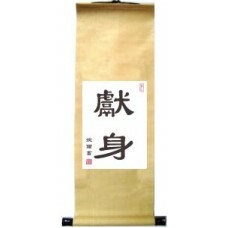 Browse our popular martial arts calligraphy phrases and select a scroll for detailed explanation and easy customization! 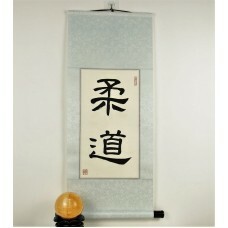 This martial arts calligraphy scroll features the words for "art of war." This can also be transla.. This kung fu calligraphy scrolls features the Chinese symbols for Bruce Lee, the most famous Chine.. These characters can be understood in Japan, China, and Korea. They mean "devotion," but can also .. This scroll displays the characters for "duty." This scroll can be a tasteful reminder to fulfill .. 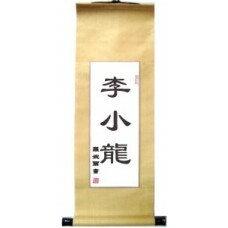 This kung fu art scroll is translated as "fortitude." It can also be translated "resolute and firm.. Martial arts phrases scroll with the Chinese characters for "inner strength." This scroll is a gre.. These Chinese characters and Japanese kanji are translated "iron fist." This is a common fighting .. This Chinese symbol and Japanese kanji scroll displays the word for "judo." This martial art was i.. This martial arts calligraphy scroll displays the words for jujitsu, the world-famous Japanese mar.. 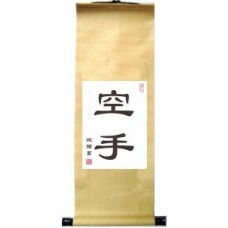 This Chinese character and Japanese kanji symbol scroll contains the characters for "karate." This.. 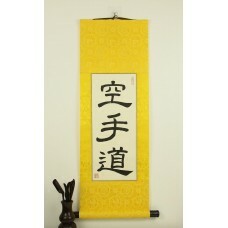 Whether you operate your own Dojo and want to give students a unique karate themed gift, simply enjo..
Chinese Pronunciation: Qi2 Shi4 Japanese Pronunciation: Ki shi This Gong Fu calligraphy art..
Who doesn't enjoy a good old fashioned Chinese kung fu movie! Warriors floating through the sky and .. 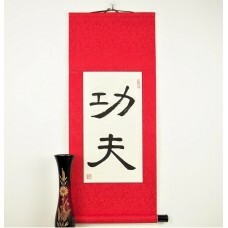 This phrase is the more popular way to say martial arts in Japanese.. Martial arts is the general ..